Full Service Social Media Management! Your campaign, nonprofit cause, or company is built on the quality of the relationships you have with people. Presenting a professional image and cohesive message on the various social media platforms today is therefore vitally important. It is also very time intensive and that is why we offer complete social media management services. We will create your accounts on the top social medial networks, and perform daily updates on your behalf of information and content that keeps your targeted audience engaged in your latest campaign. Contact us today for details! Ask your site visitors to get involved! We can place a Voter Engagement Comment Tool on your website and help you build a powerful list of supporters you can reach out to for donations, volunteer help and their votes! Ask voters what they think about a hot issue like the Minimum Wage, Medicare For All Healthcare, Climate Change, Public Education or others your voters care about! Ask voters what they want you to focus on that would make their lives and community better once you are elected. Ask your potential donors and volunteers what their highest concern is this year! THIS IS POWERFUL CUTTING EDGE VOTER ENGAGEMENT TECHNOLOGY! Rapidly build a large donor list. Build a large enthusiastic volunteer list. Build a list of voters who know you care about their concerns and issues. Your solution provider for websites, social media management and campaign management services! We are here to help you win your campaign. We will build you a great website with cutting edge tools that helps you win. If you're a campaign consultant, manager, or someone running for office, you want to make sure you have a website that helps you get your message and your vote out to your constituents! You want to use the latest most powerful social medial tools to energize and mobilize your voters! And you want to do this at a budget that leaves money in the campaign for the all important GOTV get out the vote efforts. We can help! We will work within your budget and get your site built and delivered on time! Volunteers and donors are the lifeblood of a political campaign. Websites that succeed are one's which keep people engaged! The same can be said for political campaigns. Volunteers and donors are the lifeblood of a political campaign. Your website can and should be a powerful tool you use to bring your current and future constituents into a conversation and relationship with you. How can we help you do this? Our exclusive and unique software lets you seek public input into your campaign's issues and in doing so brings them into a powerful campaign CRM Constituent Relationship Management process so you can reach out to them & ask them to donate, volunteer and otherwise engage in your campaign. This is a super powerful tool to help you win. HURRY UP AND GET INVOLVED! Get involved! Donate! Volunteer! Attend Our Events! Create a sense of urgency using our state of the art countdown clocks on your new website & get your people mobilized! Take a look at the simple, elegant and effective websites we can build for you! This website was built for a local Los Angeles Teachers Union race. It features an eloquent slide show with images of the candidate at work and on the campaign trail. It features an About Me page with an introduction to the candidate, a page listing his accomplishments, links to volunteer, to donate and an easy way to share the page with friends. It also featured candidate endorsements and a way for supporters to opt into a newsletter from the campaign. 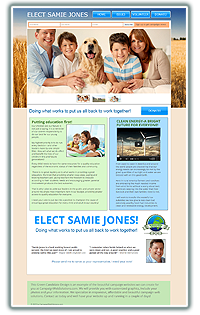 * Need a website for another type of electon or cause? We can help! Let's talk about your website & social media marketing needs today! 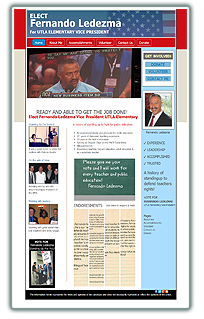 This website style is an example of a professional CMS "Content Management System" powered website that we can build for your campaign and or nonprofit cause. It focuses on making it easy to engage potential supporters as volunteers, donors and voters. Update your site or we can update it for you with your latest public events, endorsements and other announcements. 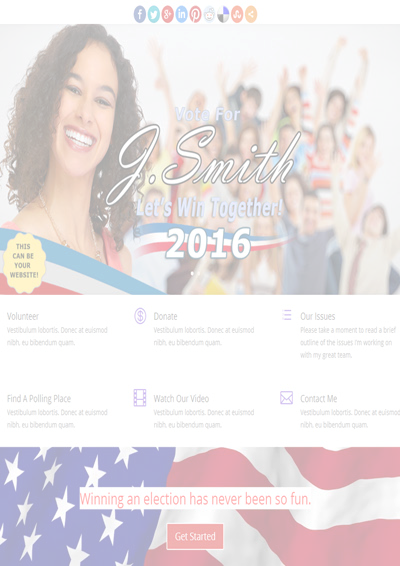 Let's get your campaign a custom website that helps you and all of your constituents win! Link to outside donation management services or we will insert code to your PayPal donation form directly on your site and customize your page for you! We do not take any percentage of your donations like some services. Using a customizable volunteer sign-up form you can get people involved instantly. We'll help you set up a newsletter opt in subscription so you can reach out to people with event information and updates. We will integrate all of your social media pages, Facebook, Twitter, and Google + into your campaign website so people can find you everywhere. We will make it easy for people to share your site with everyone! ​Who needs a great website?